With that title, obviously we are not talking about me. 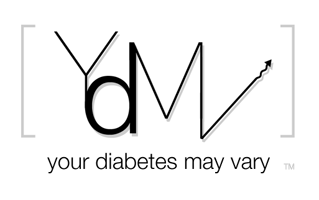 I try hard not to make this blog about diabetes stuff. Technology isn't as important as psychology or so I am trying to teach myself. Still I remain curious about diabetes management tools that may help provide a better quality of life. The thing that is coming up in the farm teams and looking like a real prospect for major leagues is CGM. About the only way to learn about this prospect is reading scouting reports, aka blogs. Wendy Morgan's Diabetes Self-Care is about as good a scouting report as there is. She blogged about the Abbott navigator when she wore it in tests. Now writes about the Minimed Real-time she wears now. She blogged in the transition between the two - that is good reading too. Her perspective is doubly valuable as she is T1 and a mom of a T1 child. As a parent of pumping T1 kids, my primary interest in CGM is to track BG to help tune basal rates, particularly overnight. Growing kids have a nasty habit of needing basal changes (YDMV!) And the kids keep growing, at astounding rates. Also I would also love a tool to help predict hypos in school as our younger D child has had unexpected lows when things are stressful - like academic testing. I admit to being concerned about yet another thing being poked into them, the younger in particular. But the larger issue is how it may effect her progress towards independence. Will it make her depend on us more, will it freak her out or will it help? Now here's a good point that has taken a long time for it to sink, in fact it is still settling in - some parents made very good comments about the importance of independence and trust at CWD's Conference last July. Independence from parents and trust from parents. Most of this came up in a discussion of another device. The device isn't that important (it collected BG and sent it wirelessly to who ever.) The comment was telling. At first there was a general buzz of excitement. As the talks went a few parents expressed the idea that they were not interested because they didn't want their kids feeling like they, the parents, were checking up on the child the time electronically. That the benefit of data collection in near real time was outweighed by the perception of diminished trust and infringement of young adults independence. That is a profoundly wise attitude about technology. It appreciates that the quality of life involves relationships as much as mechanized tools. "I've decided to wait on the CGM for my seven year-old girl. I have come to find out that it isn't the insertion that worries her most (although it absolutely does), but it is the alarms going off all the time. You know what? That happens frequently. It will really extend the amount of time she is thinking or being reminded about diabetes, which is a lot and for right now, in this first generation of devices, I am willing to let her have some space with it."